GAKKENTOSHI LINE and get off at the JR SHIJYONAWATE station. Yhen take a SHIJYONAWATESHI COMMUNITY BUS bound for RYOKUFUDAI or SATSUKIGAOKA and get off the bus at OUSAKA. The hotel is located within a 10 minute walking distance from the OUSAKA bus stop. Or take a taxi at the SHIJYONAWATE station (about 15 min to the hotel). (WAY2)Take a train of KINTETSU NARA LINE or KINTETSU HIGASHIOSAKA LINE and get off the train at the IKOMA station. Then take a taxi toget to the hotel(about 15 min). At the SHIN-OSAKA station take a train on track No.15 or 16 get to the JR OSAKA station (the next station on the SANYOHONSEN LINE) Then take the KANJYOSEN LINE and get off the train at the KYOBASHI station. Then change train to GAKKENTOSHI LINE and follow WAY1. 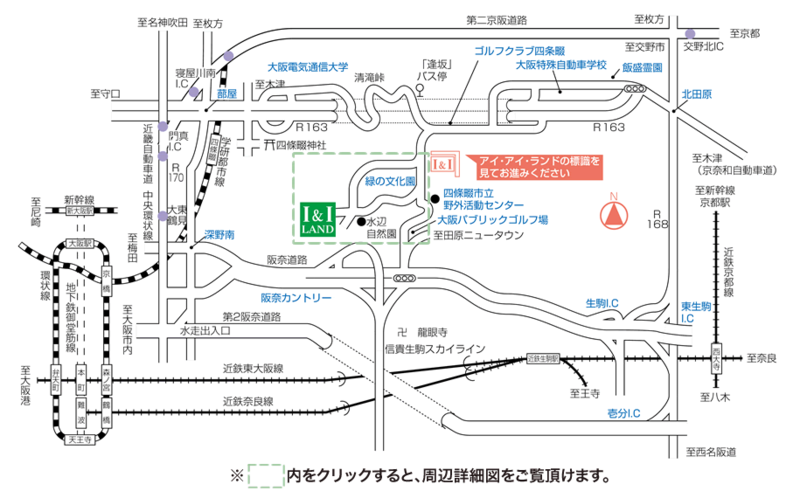 Take a limousine at No.6 or 16 bus stop bound for JR OSAKA station then follow the above route. Or take a limousine at No.0 ore 10 bus stop bound for the KINTETSU UEHONMACHI station then follow WAY2. 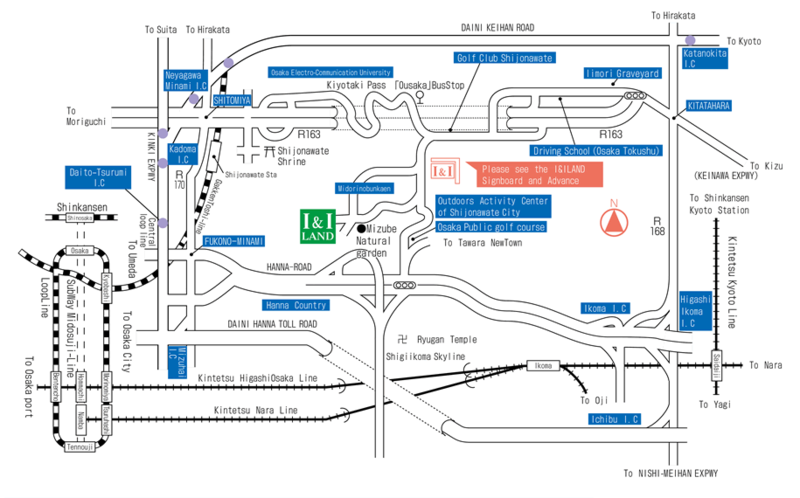 Take a limousine at the No.5 bus stop bound for the JR OSAKA station then follow the above route. Or take a limousine at the No.7 bus stop bound for the KINTETSU UEHONMACHI station or the one at the No.11 bus stop bound for MANBA then follow WAY2. The NANKAI RAILWAY also takes you from KANSAI AIRPORT to NANBA. Copyright(C) I&I LAND All Rights Reserved.